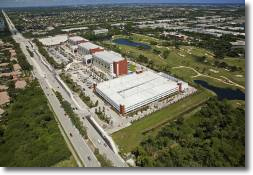 The project included the construction of a five-story office building, a three-story parking garage and two one-story parking garages all encompassing ~1,000,000 SF, as well as paved driveway and surface parking areas. Construction components included spread footings, tilt wall panels with interior concrete framing, precast joists, cast in place concrete floors and light weight roof decking. Nutting’s services included additional geotechnical exploration services, vibrocompaction monitoring of 1,898 vibrocompaction points to a depths ranging from 26’ to 33’ below the ground surface, and construction material testing including nuclear density testing (soil) and concrete compressive strength testing. Nutting also served as the threshold inspector and performed the roof inspections as well as the sunshade and off site work for Flagler Development.